Let's be real - We carry our phones absolutely everywhere. We can't live without them - So it's a pretty huge bonus when a cafe has free WiFi. Enter Cafe Nineteen - Offering all of their patrons WiFi while they eat so that we can upload our Food photos straight away! Having a birthday party? Want to host a work party? Cafe Nineteen has you covered! Hiring out their alfresco and main cafe space for functions big and small, as well as providing you with personalised menus for the event, they've got everything covered for the perfect party! When it comes to cafe's, it's the little things that matter - And Cafe Nineteen's incredible customer service is sure to put a smile on your face even after a tough day at work! Whether you need a function organised or just need adjustments made to your meal, the staff at Cafe Nineteen will go above and beyond to make sure you're treated like royalty. The quality of coffee at a cafe or restaurant can totally make or break the space, so luckily for us Cafe Nineteen has incredible coffee too! Come in for a work meeting or brunch with friends and enjoy their smooth blend. Also, their latte art is on point, so don't forget to get that Insta-shot! Never fear - There's Vegan options here! Serving up a Seasonal Mushroom Bowl and a Roast Veg Burger, as well as providing plenty of Vegetarian options including Porridge, an Avo & Feta Smash, Pancakes and Nachos, you'll easily be able to find something to eat no matter what your dietary choices. Ok so maybe this isn't totally essential for a cafe, but it's always nice to eat in a space that looks and feels super cute - and Cafe Nineteen doesn't disappoint. Decked out in wooden finishings, classic white furniture and with plenty of greenery all over the place (including hanging pot plants! ), you'll totally fall in love with the space as soon as you walk through the doors. With an increasing number of people preferring to eat Gluten-Free, it's important for cafe's to include Gluten-Free options in their menu. Whipping up Corn Fritters, Fruit Salad, Calamari, Grilled Barramundi and even Nachos, there's no shortage of delicious Gluten-Free options to grab on your next brunch date.... So we'll see you there! Ok, so maybe this should be our second reason because it's such a bonus, but did you know Cafe Nineteen has all day breakfast!? #Winning! Running an all-day breakfast menu alongside their normal breakfast menu (which finishes at 11am), you can also grab Eggs Your Way, Eggs Bennie, Fruit Salad or Fluffy Vanilla Pancakes all day long. Um, yes please! Not only does Cafe Nineteen have super-cute decor - But they're right near the water too! Located on Masthead Way opposite Australia Post, Cafe Nineteen is just a minutes walk from the bright blue waters of the Marina, so you can easily head for a romantic walk along the water right after your brunch. Move over Smashed Avo and Acai Bowls - Cafe Nineteen's French Toast is the real winner here, and is seriously one of the reasons you should visit this place if you haven't already. I mean, look at it - It's art on a plate! Made with Golden Sourdough toast and topped perfectly with strawberries, mint sugar, whipped cream and maple syrup, we think it's the embodiment of #foodporn on a plate... And it tastes even better! We all deserve to spoil ourselves with cake sometimes, and anybody who ever tells you otherwise is wrong. Not only does Cafe Nineteen do a super tasty French Toast and Pancakes, but they've also got a pastry cabinet full of treats like Red Velvet Cupcakes, Chocolate Cheesecakes, Lemon Tarts, Merangue and more. You'll find us there with one of everything, but if you need an excuse to visit as much as possible, their cabinet selection is always changing - And you have to try it all, right? Let's be real - It's a major bonus if a cafe has food that's worthy of being on our Instagram feeds. Our life goal is to take the perfect food photo, and with Cafe Nineteen serving up some seriously photogenic food, our goals are becoming a whole lot more achievable. I mean, perfectly decorated French Toast, mouth-watering pancakes and incredible latte art? #YesPlease! 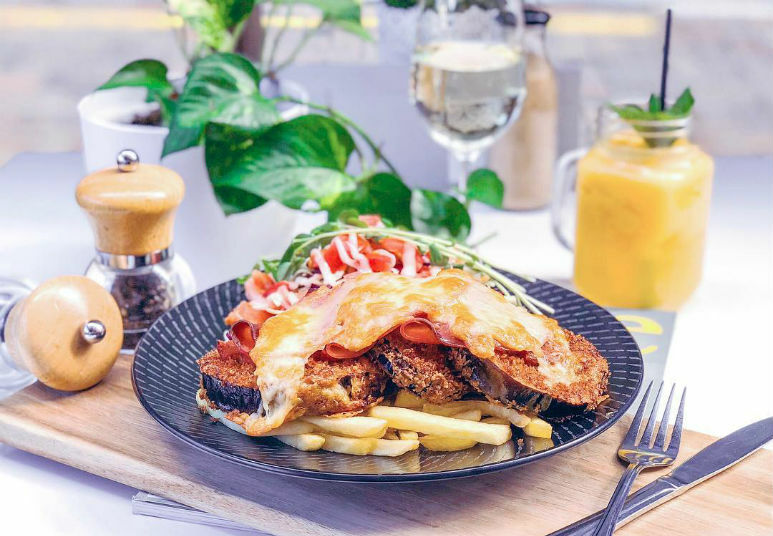 As much as we love delving into the hub of cafe's and restaurants down at Broadbeach, Southport and Surfers Paradise, sometimes it's nice to enjoy a brunch away from the bustle of life. Located in the Northern part of the GC away from all of the hustle and bustle of life, Cafe Nineteen is a much more peaceful space to enjoy brunch - And sometimes peaceful looks like a pretty dang good option. Ok, we admit it, we're a sucker for a good Acai Bowl or Smoothie. With the mercury rising over thirty degrees pretty consistently at the moment, we're basically counting Acai Smoothies in our sleep. On the bright side, Cafe Nineteen does a seriously delicious Acai Smoothie (and a seriously #Instaworthy Acai Bowl), so we don't have to worry about going Acai-less this Summer! Cafe Nineteen may not be known as the space to go for a hangover meal, but did you know they've actually got the perfect cure? Not only do they have some seriously amazing coffee, but they also whip up a delicious Big Breakfast and Bacon and Egg Burger for breakfast. Don't make it in for breakfast? Grab their Pork, Fennel & Bacon Burger, Nachos or Grilled Chicken Burger! Hang-over cured! As much as we love going out for brunch, it's a difficult lifestyle to maintain if it costs a kidney every time you want to order a meal. Luckily for us, Cafe Nineteen's food is super affordable! Pricing the majority of their food around the $17 mark - With some food as cheap as $9 and the most expensive at $23 (a Caesar Salad with Smoked Salmon) - It won't totally break the bank to go for your next gals brunch out here! Life is always better with a little bit of wine involved - So we were stoked the first time we discovered that Cafe Nineteen is licensed! Stocking Sparkling Wine, Moscato, Sav Blanc, Chardonnay, Cab Merlot and plenty more, as well as beer and spirits, they've got us totally covered in the drinks department. Cheers! Let's be real - One of the most irritating things is ordering a meal for our children then having to throw 90% of it in the garbage because they only wanted the fries. Well, we have some good news - Cafe Nineteen has a kids menu too! Order your little ones a mini breakfast or pancake stack from their all-day breakfast menu, or grab them calamari or chicken strips served with chips for a perfect lunch out. Problem solved! 19. They're Open On Public Holidays! Public holidays are for going to the beach, hanging out with friends and finally going on those long-awaited brunch dates - So luckily for us they're open on Public Holidays as well! Open basically all the time, Cafe Nineteen has your breakfast, brunch, lunch, wine and coffee needs sorted on every day ending in Y - So the only question is, why not go and visit?